One was curiosity triggered by an article I’d read that ranked the Toledo Metro Station in Naples as the most impressive underground station in Europe, and the second was to escape the heat. The day we first went down was a Sunday in early August. 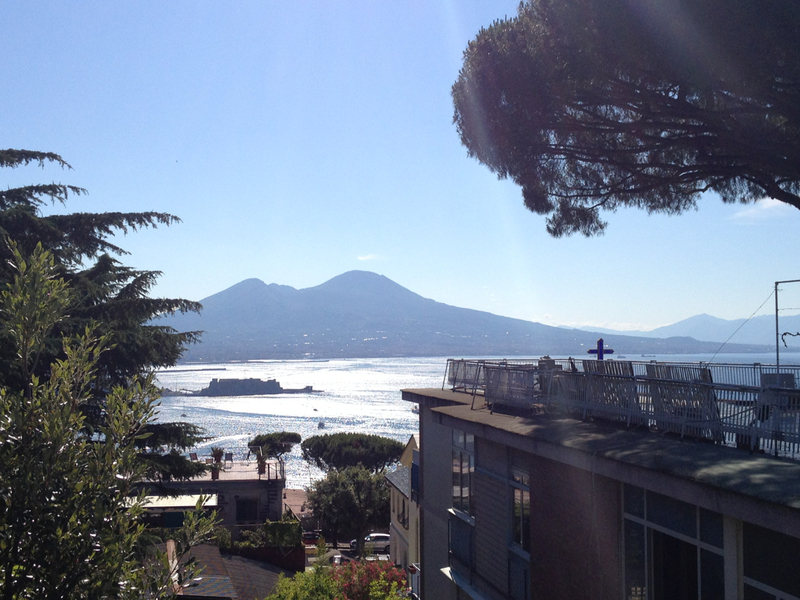 It was mid-afternoon and Naples was closed – either on riposo or holiday – and the thick, damp heat above ground was so heavy we could hardly move. The obvious place to be was on a boat … or underground. 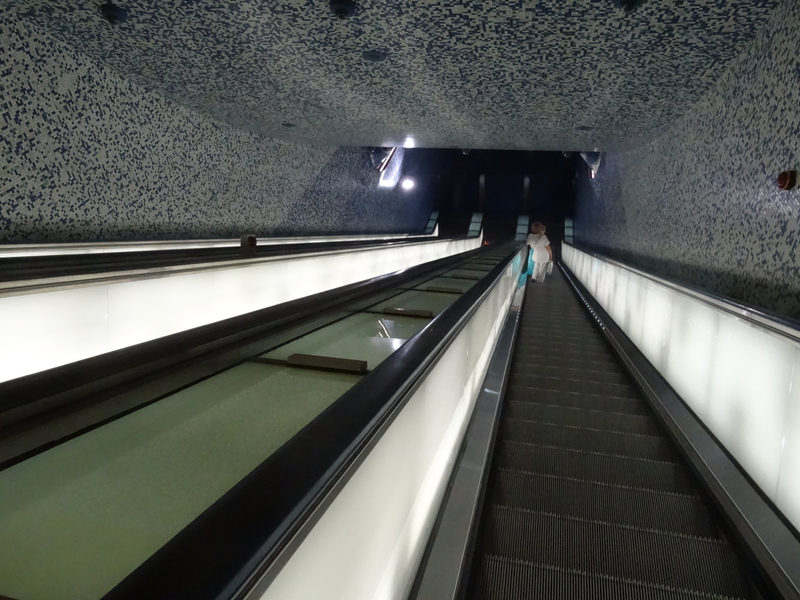 The only option for us that day was underground – it had to be the Toledo Metro. An ordinary set of stairs led us down past the big, red M to an entrance hall where we got our first taste of what has won Toledo its awards. 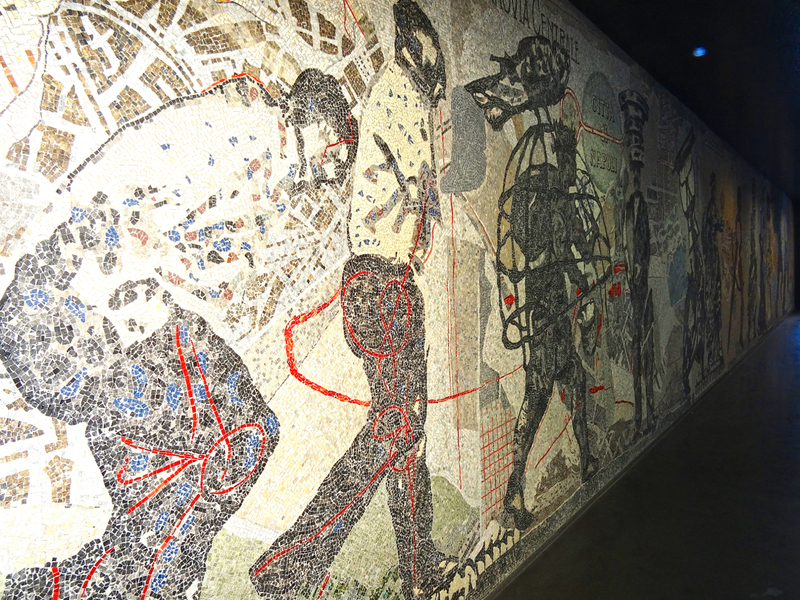 Along the whole of one wall there is a detailed mosaic designed by the South African artist William Kentridge. Kentridge’s heroic, sketchy figures are larger than life. Strange and strong they process in tiny tiles the colour of the earth across centuries of saints and story-telling, towards Vesuvius. 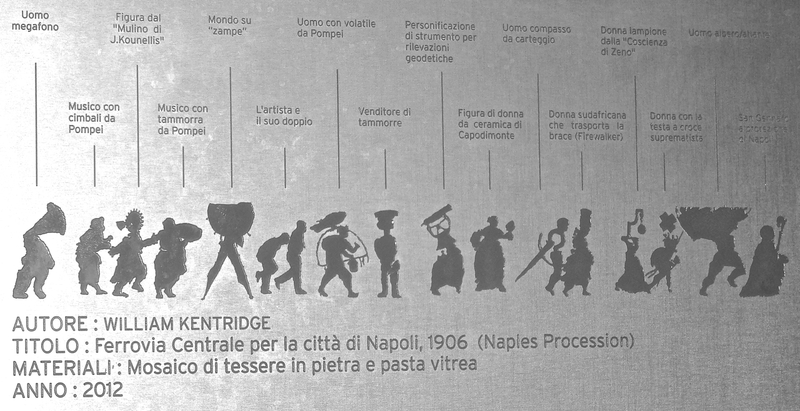 That was my first meeting with Kentridge – I’d never heard of him until I saw his signature beneath Vesuvius. Since then I’ve learned more. He’s Johannesburg-based, heavily decorated with awards, and perhaps best-known for the work he does with charcoal and film. 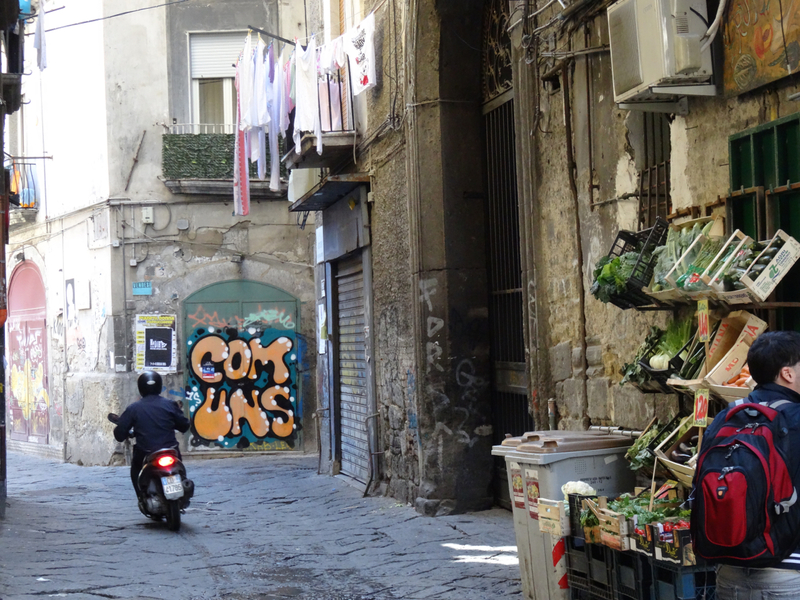 His style is quick and works on layers that build up and out from a few basic images – a great fit for Naples, a city that has always built what comes next on top of what came before. 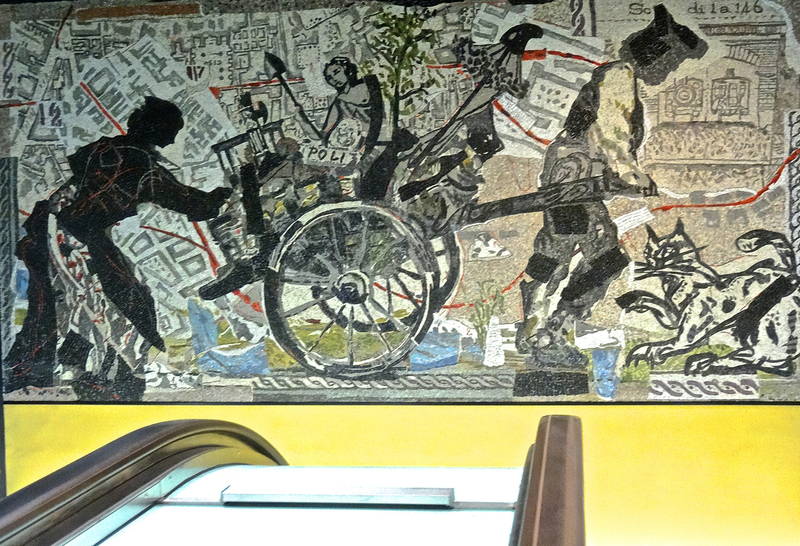 From the entrance we headed down the escalators and passed under another symbolic Kentridge mosaic. It is beyond this that the mood changes from earth to water, from ancient browns to blues – shifting, sub-aqua blues. We sank deeper, some 38 metres deeper, into the world of light, mosaic and water created by the Spanish firm Oscar Tusquets Blanca. We cruised down the long steel stairs, lower and lower, into the quiet, cool, almost-midnight world lit by curved hollows of light that tunnelled back up to street level. The wide tubes of light passed suddenly overhead and tilted us backwards to catch sight of the tiny faces that peered down at ours. Occasionally we were joined by other travellers, all of us journeying, perhaps just from A to B, but the art, the experience, was unavoidable. 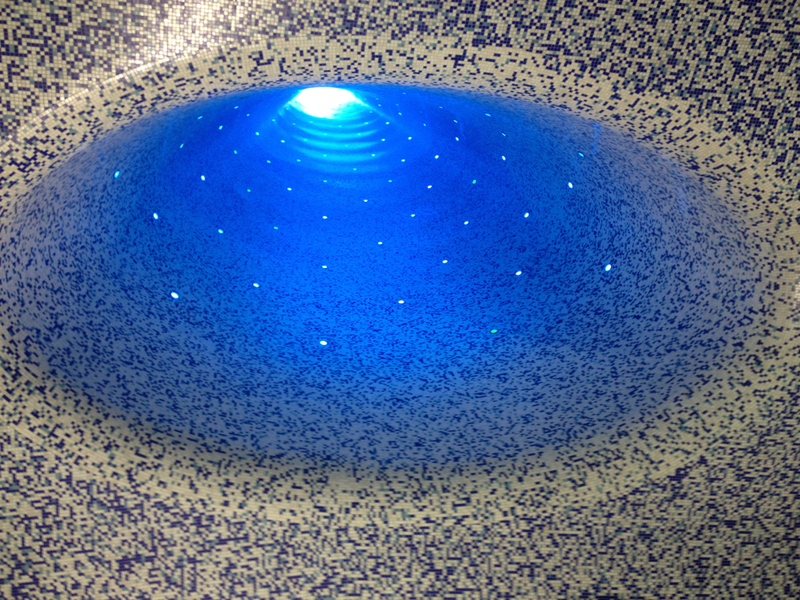 In the long hall at the foot of the escalators light boxes along the walls turn panels of blue into wave and movement. This work, by Bob Wilson, brings sunshine and imagined sea breeze into the deep walks of the station. It all feels calm even on the platforms which are somehow still un-grimed by travel and trains. We sat on a blue-tiled ledge and waited. The train arrived within a few minutes, clean and Sunday-empty. 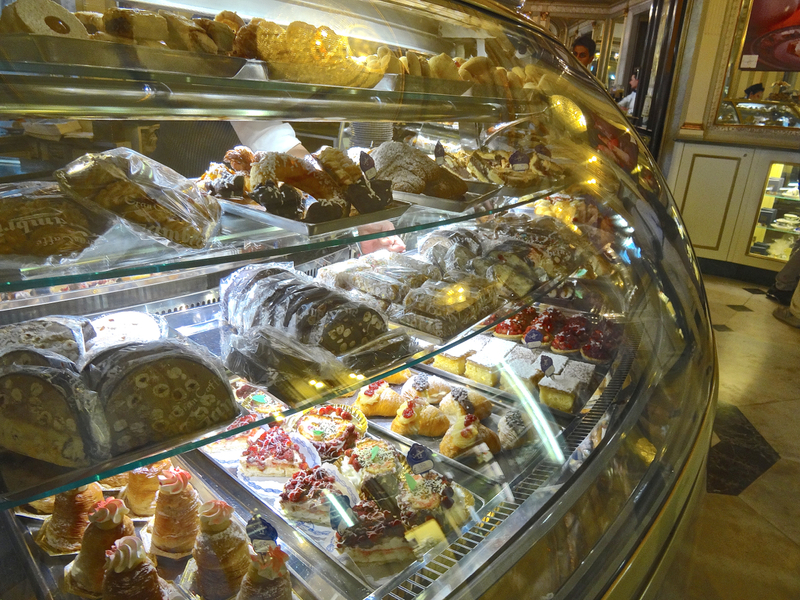 It scooped us through its doors and took us on the one stop to Piazza Dante. Here, the end of our journey, we had to leave the cool and the fresh art, and force ourselves back into the sunshine – back into the damp wrap of the second of the 2015 heat surges. But at least by then, by five in the afternoon, there were signs of life. The city, tough as old rocks but as soft-centred as its pastries, stirred … it was time for gelato and the Sunday evening stroll. Altogether there are now 14 metro art stations in Naples. 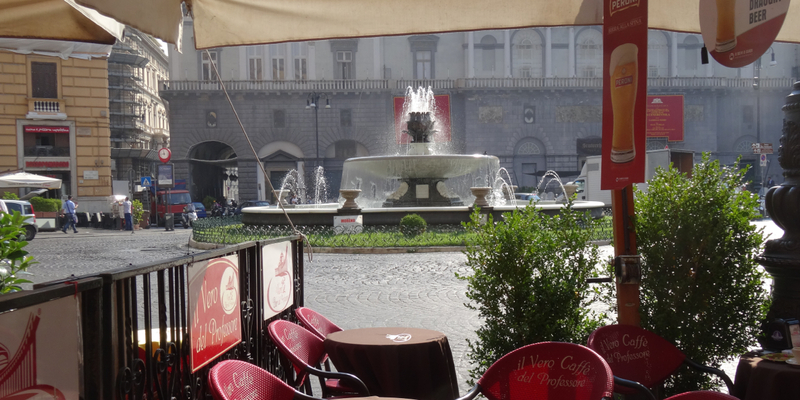 This entry was posted in Italy, Naples, Places to see in Naples and tagged Art, Italy, mosaics, Napoli, Piazza Dante, sfolgiatelle, Toledo Metro Station, William Kentridge. Bookmark the permalink. Above ground, below ground … in the middle of the ocean. It’s a never-ending fascination for me! Thanks, Georgie! Thank you! I’ve learned and enjoyed so much … and there is still much, much more to see (and learn!). 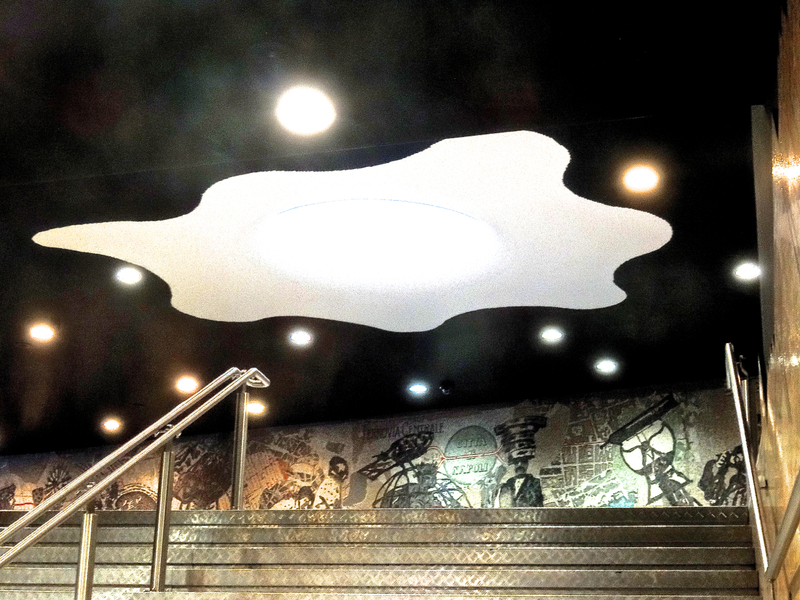 Thanks Lyn – the art metro stations are really interesting – another is on the way. Not sure though when it will be officially opened.